For any business, it is important to handle inbound contact queries is a seamless yet structured way. These queries could be trade enquiries or offers that could translate to business. Having a “contact us” page or form on company website is very common and there already is a way to handle it. Your website developer does not charge anything extra for this form. It is already very simple and there seems to be little scope of improving it further. The trouble starts after receiving a query. Normally these queries are forwarded to the organization through an email and emails are not that simple to manage inherently. Who should receive this email? What would be the action or actions that he would be required to take? What is the time limit? How should he respond? Who will approve the response? What if he does not handle it as required? Who is tracking these queries and how? What data is available for analysis and how? These are just a few concerns that will always be there. Like most other issues, Tuhund has a solution for this too. 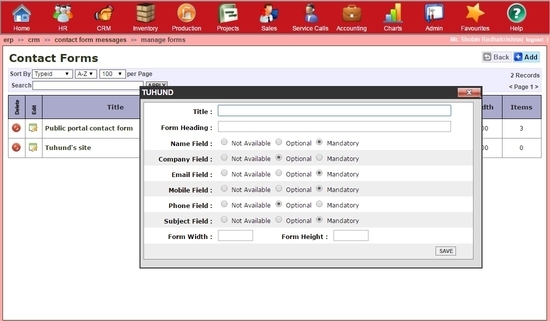 Tuhund lets you create any number of contact forms which can be embedded in any website. There are several ways of embedding. 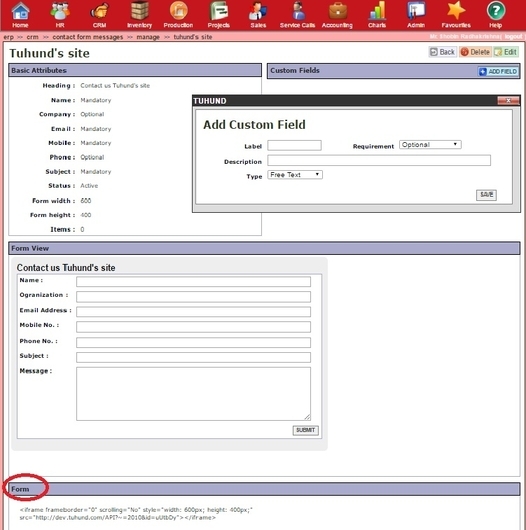 Once embedded, the form opens in the website where it has been embedded and once a visitor fills in a form and submits, it is automatically recorded in Tuhund. Every form can be assigned to any user, employee or designation for handling and the users handling it as well as the managers have the option to choose how they would like to be notified. 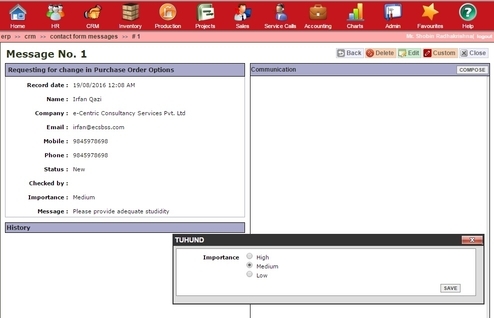 They can choose one or any combination from Notifier, Email, SMS or message in their Tuhund ERP home page. From there on it will be handled in most structured way like every other module in Tuhund. In the list page you can search, sort, filter in lot of ways besides there are BI reports for analysis. You may also choose to auto-notify the sender through email and/or SMS. It works in a simple way. All you need to do is to create a form and specify the fields that are required in two easy steps. Contact forms sub-module is inside the CRM module. When you click on contact forms icon, system will display main page where you can see the list of messages received so far. 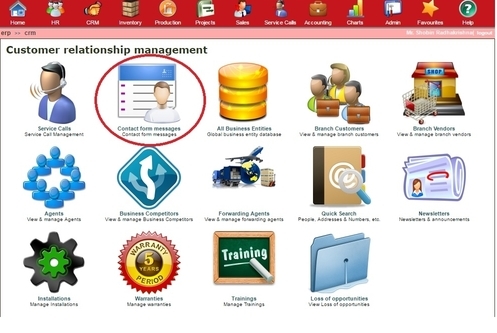 On the right top right corner you will find a Manage Button, you must click on the button, and then it will take you to the next page where you can manage the contact forms. To create a new form, click on the “Add” button. Specify a distinct, easily identifiable name for the form which will be used for internal reference. Specify the form heading. Form heading will be displayed on top of the contact form created. Finally choose the fields from the pre-specified list, Name, Company, Email, Mobile, Phone and Subject to specify which fields are required and which ones are mandatory to be filled in. Finally specify width and height of the form in pixels and save. System will automatically generate embedding code of contact form based on the attributes and information you gave before saving it. You can find the HTML embed code at the bottom of the page below the preview of the form. Preview form is fully functional. That means, you can use it for testing. You can also edit the details of the fields if something is wrong. Any number and types of custom fields can be added. Some might have multiple portals you can use the same contact form or you can create the new one. Also, you can embed it to the third party website; if you have a blog or something hosted by some other site you can use the contact form code to display it there. Now, where can I find the messages? All the messages that you receive will be stored in the CONTACT FORM MESSAGES, when you click on the icon, it will take you to the main page where you can see the list of messages that have come. You can see the Contact details and read the subject line of the message from the main page itself, if you click on the message it will show complete details of the message and also you will see more options, you can compose a mail directly from the same page, you can see the past history below. And on the right top, you will see CLOSE button if you click on that, system will close the message, it will not show on the page unless you filter your search. You can search previous messages by refining your search filter. The best thing about TUHUND's Contact form messages is, it could be linked with your mobile number also to your mailbox via ERP, so that every time you get a new message you will receive an alert to your mobile number and to your mailbox. You can do this settings in admin control panel by changing the security functions. Isn’t so cool? If you are really focused on the growth of your business TUHUND’s Contact Form is an extraordinary tool for you to build a good customer relationship to your business.